Hello! It’s been a while! I haven’t had a styled blog post up in a few weeks since I’ve been travelling so much! I’m off again soon on a few other trips this summer (I’m booking NYC as we speak for a few weeks from now, a couple stay-cations in Toronto, and then Cape Cod, Nantucket and Martha’s Vineyard this summer), so it’s going to be a busy one! Disney was amazing – I will have a full blog post up on that hopefully later this week! There is so much to cover – it was ten days so it was a long trip, but one we didn’t want to come home from! This sweater – I so badly wanted to bring it on my trip but because the Florida weather was going to be so hot I decided against it. Really I should have brought it because it’s the perfect summer sweater – lightweight, and perfect for cool summer nights! I thought I would switch things up with green stripes instead of my usual blue and white (this sweater comes in a few different colours from Talbots), and the detail on it is so pretty! Talbots always makes their clothing with such pretty detail – it makes everything I have from them that much more special. Isn’t this bag the cutest! 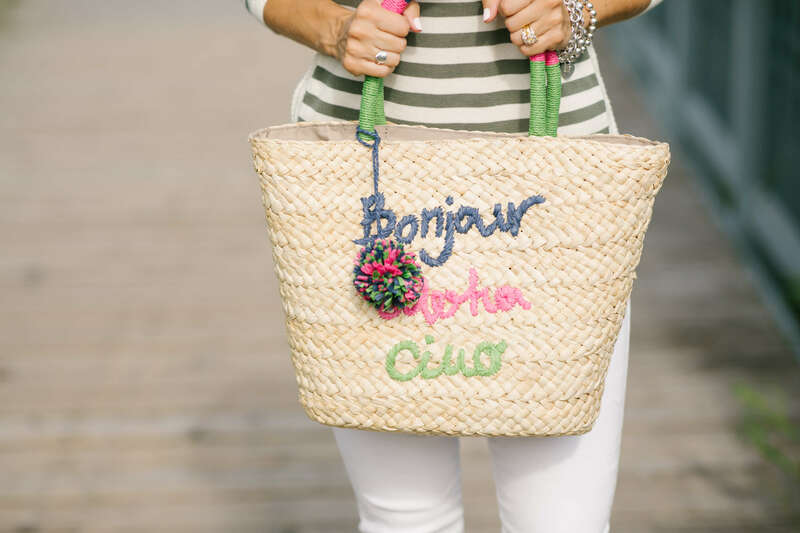 I love the handles – I have so many straw bags that don’t have anything on the handles and they end up not being as comfortable as this. It’s also on sale right now! I just love it all paired with white jeans – the perfect summer staple! This look is absolutely coming with me to Cape Cod!